Words by Kevin Doocey on November 19, 2011 . A spirited defeat at the Etihad Stadium is the only thing you can call it. Two penalties and an individual mistake from Ryan Taylor presented Manchester City with three opportunities that they gladly took, and despite a late goal from Dan Gosling - Newcastle United recorded just their first defeat of the season. A team without Cheik Tioté, Leon Best, and Sylvain Marveaux, who would have all been likely starters, played a very solid first half only for two goals in the space of three minutes to finish off any chances we might have had of winning it. All of this came after Demba Ba had a close-range effort palmed away by Joe Hart and a header from the same man from the resulting corner misguided and nodded wide. A handball from Ryan Taylor saw Mario Baloteeli cooly slot away the resulting penalty, and then a mix-up with Ryan Taylor’s feet gave Micah Richards the chance to scoop home their second of the evening. Their third came from the spot thanks to Kun Aguero when Hatem Ben Arfa was adjudged to have bundled down the Richards. Dan Gosling pounced on a spill from Joe Hart to tap in a consolation for the fantastic travelling Geordie fans. In the midst of this defeat I was very impressed by our midfield, including Yohan Cabaye, Sammy Ameobi, and a certain Danny Guthrie. Our passing was neat and tidy at times and Guthrie/Cabaye rarely got caught on the ball. Ameobi saw a lot of action down the wing and at times showed bits of his glimmering potential. The one man I’ve picked from some very impressive individual displays - including Hatem Ben Arfa who was desperately unlucky not to have nabbed a goal in the 90 minutes - was Danny Guthrie. 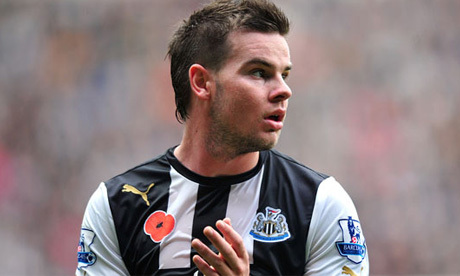 A forgotten man at St.James’ Park not so long ago. However, battling through his endless list of injuries Guthrie has saved his career at Newcastle United and Alan Pardew is ready to reward the Shrewsbury born lad with a new long-term contract. It’s great to see Guthrie coming back and he looked very sharp today - his passing game which happened to always be one of his strong-points showing through against a quality Manchester City side. His link-up play with Cabaye and our wingers was pleasing to note and his work-rate was 100% - including his endless tracking-back. He just happened to be on the wrong end of the result! He also had a solid game against Everton at St.James’ Park a few weeks ago, but seemed even quicker and sharper at the Etihad Stadium today, or so I thought. We always held high hopes for the guy at NUFC and hopefully he is ready to fulfill the potential he has. With himself, Tioté, Cabaye, and today’s goalscorer Dan Gosling all vying for the centre-mid positions we’ll hopefully get the best out of all three in the next few years. All of them are around the same age and yet to play their prime football - which is exciting to think about. One thing is for certain though - Guthrie has a future with this club and if he continues to perform the way he has then it’ll be tough to bench the guy.